Walking in the warm has become a dream as the British winter is now taking hold. A wet summer followed by a wet autumn, now a wet cold winter has left me dreaming of some warmth and the chance to walk in some sunshine. Walking holidays don’t need to be expensive, especially if southern Spain is your destination. There are cheap flights from all U.K. airports to Malaga which can be the gateway to a wonderful walking holiday in Andalucía’s Alpujarra region. The Alpujarra is the area nestling into the southern slopes of Spain’s Sierra Nevada Mountains. The area has been mainly influenced by the Berber Arabs who colonised this area from the 8th Century and is characterised by pretty white villages linked by a network of paths, mule tracks and watercourses known as Acequia’s. Mountain House Holidays (operating from their mountain house high in the Alpujarra) have a vast local knowledge of the walking in the area and their walks are led by qualified International Mountain Leaders. 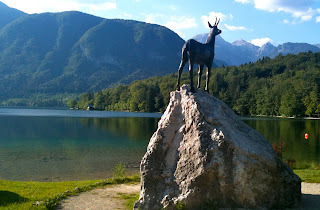 There are walking holidays scheduled for February, April and May. Walking in T shirts is not uncommon in winer! 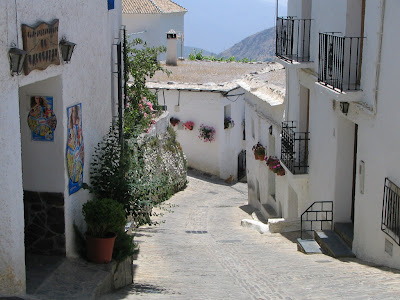 The walking in the Alpujarra is classic hill walking so don’t expect flat easy paths, but is well within the capabilities of those used to walking at a basic level in British hills (South Downs, Peak District, etc.). A circuit in the Poqueira Gorge, which takes in the delights of the prettiest three villages, Capileira, Bubion and Pampaneira. The walking here is a mixture of walking through ancient terraces as we ascend the valley before taking in the delights of the “whitewashed” villages with their narrow streets, public Lavado’s where old ladies can still be seen doing their washing and of course the odd bar! A circuit in the Taha, a name given to the valley beneath Trevelez which is Spain’s highest village, famous for its dry cured ham. The walking here takes a line on an old mule track through improbable cliffs, past goat farms, ancient bridges, terraces and white washed villages. A circuit above the spa town of Lanjaron. This walk follows ancient mule tracks through terraces, follows acequia’s and gives superb views down to the coast and on clear days across to the mountains of North Africa. Lanjaron is famous for it’s spa water and as a “resort” has many craft shops, and a range of bars and restaurants. Mountain House Holidays offer you a complete package, starting from when we meet you at Malaga Airport through until when we drop you back at the airport at the end of your holiday. You just arrange your flight and insurance, we organise your travel in Spain, your full board accommodation and a week of fully guided walking led by qualified walk leaders with a full local knowledge of the area. For those who prefer “self guided” holidays, we are able to organise accommodation and provide written details of the walks we lead. Sandra is a regular visitor to The Sierra Nevada and last year managed The Integral, (a traverse of all the 3000m peaks in the Sierra Nevada), with Mountain House Holidays. Mike and Jane of Mountain House were invited to accompany Sandra on her final Munro, Driesh 947m near Glen Doll in Scotland. Around 30 of us accompanied Sandra to the summit in deteriorating weather where celebration drinks, cava and a range of single malt whiskies, were consumed before descending and retreating to the pub for “stovies” and more drink. Congratulations Sandra on completing your Munro’s! A Munro is a Scottish mountain with a height of 914m or higher. There are 283 Munro’s listed in the SMC guide though there is the odd dispute over a couple of peaks. After experiencing the Scottish summer weather and the infamous midge, we now remain convinced that Spain's Sierra Nevada is the place to be! It should be noted that Mike and Jane of Sierra Nevada Guides have a house at 1300m above sea level, higher than most Munro's. Mountain House has been providing rock climbing and abseiling sessions in The Peak District since 2004 as part of its programme of multi-activity holidays. Recently due to demand we have decided to make ourselves available to run “taster” sessions and skills coaching. We are so lucky living and working in The Peak District where there are many excellent venues for both rock climbing and abseiling. Mike and Jane who own Mountain House and their team of instructors are all qualified to organise and run climbing sessions. Mike is a former Director of Mountain Leader Training and former Vice President of The British Mountaineering Council. Jane and Mike have run several training courses for the Mountain Leader Training Association. Sessions can be whole day, half day or for an evening (summer months). Details and prices can be found on our website.